[Breakup Files] Did Guli Nazha Initiate the Breakup with Hans Zhang? There is speculation that Guli Nazha (古力娜扎) initiated the breakup with Hans Zhang (张翰), who she started dating in 2014. 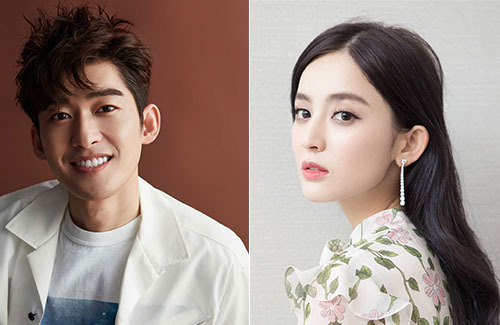 In a statement released several days ago, the Chinese actors announced through their respective studios that they have split, and have been apart since October. The announcement came unexpectedly, as the couple still seemed very much together from paparazzi photos that were shot back in September. Although the couple stated in their announcement that it was a peaceful breakup, there is speculation that it was Guli Nazha who had ended the relationship. Their breakup had supposedly occurred in mid-October, but Hans showed no signs of being amidst a breakup when he angrily responded to Guli Nazha’s anti-fans on Weibo back in early October. The couple were even rumored to have been heading for marriage. A netizen claimed that Hans had booked a wedding venue, but he canceled the reservation soon after splitting with Guli Nazha. But whether or not it was really Guli Nazha who ended the relationship, the reason behind the breakup shouldn’t be a surprise—the couple do not envision the same future. Hans have always been a very traditional man, and he perhaps would have preferred his wife to stay at home to take care of the family. Guli Nazha, whose popularity have risen in recent years, is very focused on her career. 14 comments to [Breakup Files] Did Guli Nazha Initiate the Breakup with Hans Zhang? The problrm with young couples nowadays is that they are into me, me, me, what I want. There is no compromise. Guli Nazha should have a career. This is not the era where womem slave over a pot with a child sleeping, one on her hip and one at her feet while one is in her tummy. Womem want to work and that is their perogative. However, a womam should be also allowed to build her life and time for children around that career. All work and no family time is not healthy. In the meantime, Hans should realise this is not the stoneage, and women love the independence of being a working woman in society. All that is needed is a bit of compromising and communication. Looks like they were wrapped up in their individual needs and me-syndrone entitlement. Where did you get so much details on the reason they broke up? The article didn’t specify the reason. Only speculated that Naza is the 1 to initiate because Han was still very protective and caring not long b4 the break up. hehe, if Guli Nazha places that much emphasis on her career, she wouldn’t have picked such poor projects in recent years. I mean, she IS popular…but definitely not for her acting. haven’t seen a single one of her dramas yet where i was really impressed with her role and acting. dilraba has outranked her by leaps and bounds since they both started. i really wouldn’t be that devastated if hans convinced her to be a stay-at-home wife/mother. however, on an objective level, a woman should be able to decide what she wants to do in life and hans shouldn’t be so stubborn about that. @coralie Didn’t Dilreba graduate from an acting school? @coralie I see. I thought GLNZ is a model turned actress. Dilreba hit it off with 3l3w. I recalled her playing supporting in many dramas. Nothing memorable. @tiffany dilreba got popular from pretty li huizhen. and then from there got casted in 3l3w. If a project is not good, viewers will criticise the actors whether their acting is good, bad, or in between. These young and upcoming artists are not all rich and they take crappy projects because they need a ricebowl for themselves, and sometimes their families too. We can only hope that by focusing more on her career, Guli Nazha will improve her acting. Young artists need the encouragement , even from netizens. At least Guli Nazha is not whining like Ms Motor Mouth about how she tried her best. They are both young and their popularity is rising fast. Not a good time to get hooked. Even if they do, it may not last. No supporting facts but just according to how I felt. I don’t know whether it was ZH or ZS who initiated the break up, but ZH seemed to be the one netizens blamed the most. ZH was really popular before that break up, just like FSF who declined after breaking up with gorgeous NiNi. Poor men, whatever is the cause of the break up, it’s always all of the guys fault no matter what. But I got to say ZH really did moved on very fast after his first break up. So when GLNZ was dating ZH, that was totally not a popular date at all, and I feel she even lose fans because of it. Although CP5 was not good, I got to say netizens really exaggerated at how terrible GLNZ acting was when most of the actors in there were not any better. That gave me the feeling it was because of people villianizing her as a 3rd wheeler. I think GLNZ started out good, her young innocent look in Xuan Yuan Sword with all the big stars was much appreciated and then it just went down an unfortunate slope. Oh well. They are both young. They will get over it and find someone more suitable. @m0m0 LOL, TREES in the forest. If she cared about her career so much she should be taking roles as supporting or get acting lessons since she’s not a great actress and never improved over the yrs. And really boy your girl cannot act so expect people to criticize her. Its nice to see that people aren’t let down by mean words, but honestly actors will always receive critique on their acting and should find ways to improve instead of ignoring it by getting someone standup for them.